This review first ran in the Nov. 23 edition of The Hamilton Spectator. You’ve worked hard to build a career, a company and a good life for your family. You’re now looking to share your wealth. Maybe you want to make a difference here in Hamilton, where one in four kids live in poverty and some of our priority neighbourhoods have health outcomes that more closely mirror Bangladesh than Brooklyn. Or maybe you want to help out the 1.2 billion people beyond our borders who earn less than $1.50 a day. There’s no shortage of problems to solve and worthy organizations to support. So what should you do? Look past the news headlines and celebrity endorsements, says William MacAskill, author of Doing Good Better, an associate professor at the University of Cambridge, co-founder of two non-profits and an advocate for effective altruism. 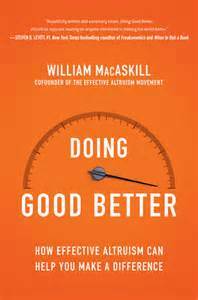 “I believe that by combining the heart and the head – by applying data and reason to altruistic acts – we can turn our good intentions into astonishingly good outcomes,” says MacAskill. MacAskill calls PlayPump a cautionary tale. Villages in Africa were given merry-go-rounds that doubled as water pumps. Every spin of the merry-go-round pumped water out of a well and into a storage tank. Kids now had somewhere to play and the grown-ups were spared from walking miles or waiting hours for clean water. PlayPump won a World Bank Development Marketplace Award plus money and endorsements from notables including the Case Foundation, the One Foundation, Laura Bush, Bill Clinton and Jay-Z. But then came the reports from organizations like UNICEF. PlayPump needed constant force to spin which left kids exhausted. Some were falling off and breaking limbs while others had to be paid to play on the merry-go-round. Sometimes it was left to the adults to spin the PlayPump. To meet the daily water needs of a typical village, PlayPump had to be spinning 27 hours a day. And when the $14,000 pumps broke, there was no easy fix. “No one had asked the local communities if they wanted a PlayPump in the first place,” says MacAskill. With less effort at a lower cost, a hand pump that doesn’t grab headlines, awards and endorsements can provide five times as much water as PlayPump. How many people will benefit and by how much? What are the chances of success and how good would success be? And what if you’re looking to do good and make a difference with your career? Signing up to work or volunteer with a nonprofit is one option. It’s not one that MacAskill often recommends to freshly minted grads, given that you can gain more skills and credentials with for-profit companies that have the resources to invest in your career development. It’s worth remembering that anyone in Hamilton earning $28,000 a year is richer than 95 per cent of the world’s population. If you earn only $11,000, you’re among the world’s richest 15 per cent. So donating even a small amount of money can lead to an outsized contribution in developing countries. Start a habit of regular giving today, says MacAskill. “Sign up to make a regular donation, even if its’ just $10 per month. This is the easiest and most tangible way of having a massive immediate positive impact.” Just do your homework first and invest wisely. This review first ran in the Nov. 9 edition of The Hamilton Spectator. It’s not entirely your fault that you frustrate some of your older co-workers. After all, you were raised by helicopter parents on steroids. You went to schools that treated you more like a customer than a student. You grew up a digital native, with smart phones and social media changing how you think and communicate. And with all these Baby Boomers retiring and young talent in short supply, you were wined, dined and signed for your technical skills with no questions asked about your soft skills. So we shouldn’t be shocked if you sometimes confuse your boss with a surrogate parent whose prime directive is to serve, praise, shelter, amuse and spare you from thankless tasks and daily grinds. Gen Zers are the ultimate non-conformists in an age of non-conformism, says author Bruce Tulgan about the 20-somethings now joining the workforce. Good luck with that. Ignoring the soft skills gap does no favours for Gen Zers or their employers. Failing to close the gap can derail careers and cripple organizations. Tulgan slots soft skills into three categories. Professionalism, which includes soft skills like self-evaluation, personal responsibility, a positive attitude, good work habits and people skills. Critical thinking, with the essential soft skills of proactive learning, problem solving and decision-making. Followership, built on key behaviors of respect for context, citizenship, service and teamwork. So how do organizations with a default-defined culture close the growing gap in soft skills? That means hiring for soft skills. Developing those skills in both your new hires and veterans. Promoting and rewarding employees who exhibit those skills and cutting loose those who don’t. 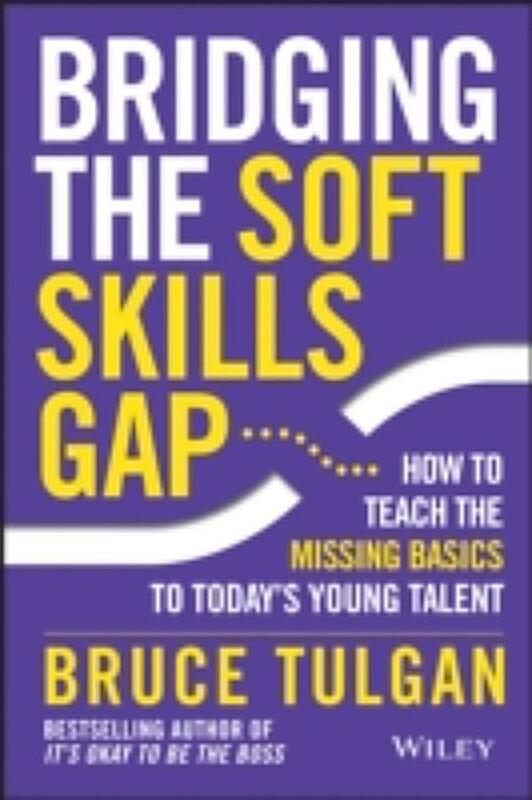 Drawing from best practices at employers that value and know how to develop soft skills, Tulgan offers up lesson plans for teaching the missing basics of professionalism, critical thinking and followership.